A stunning ballad, full of Gigi Gryce's identifiable charm and grace, shown through two recordings. Melody/solo transcription editions are available for the Art Farmer & Gigi Gryce recording. The lead sheets are good for both recordings, and there's an exclusive jazzleadsheets.com recording plus a minus melody track. Gigi Gryce wrote some gorgeous ballads, and this is certainly one of them. Our audio excerpt starts with his intro, which is also in our lead sheets and is used in both recordings and in our minus you edition. The introduction establishes a motif of leaps to and from a single note, which is repeated throughout the A sections. The melody has a traditional AABA form of 32 measures, and all of the A sections are identical except for the last measure. The melody, while relatively simple and singable, is harmonically complex as it alternates between landing on chord tones and tensions. As a ballad, this tune allows for melodic and rhythmic interpretation, an example of which can be heard in the recording with Gigi and Art Farmer. A transcription of both Gigi's and Art Farmer's melody interpretations and solos is available; click on the Solos tab for more details. Note: the lead sheets available under the Farmer/Gryce album cover are the same as the ones under The Gigi Gryce Project album cover. If you select one, it will automatically be checked on the other album, but you'll only be purchasing one. 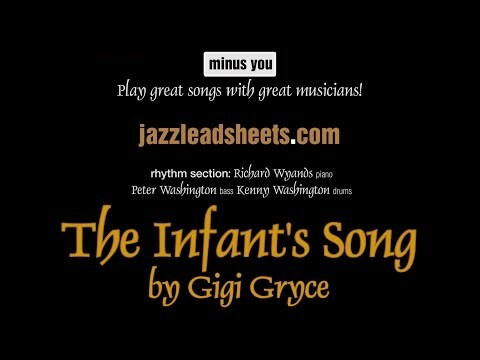 When Art Farmer told Gigi that Prestige Record's owner, Bob Weinstock, had just become a father, Gigi decided to name his new ballad The Infant's Song in honor of Weinstock's new son. Weinstock thought this was very nice, and said that his son never forgot that a song was named for him. From Rat Race Blues - The Musical Life of Gigi Gryce (a book by Noal Cohen & Michael Fitzgerald). Learn more about Gigi Gryce at Noal Cohen's Jazz History website. Also see Gryce's discography. See other titles recorded on this album. Note from Don Sickler: I fell in love with this beautiful ballad the first time I heard this recording. I'd always been shocked that no one else had recorded it so I suggested it to Ralph Moore and Bobby Porcelli, who both also fell in love with it, as you can tell from listening to our audio clip. In 2009, I also had the honor of producing the album for the winner of the 2008 Thelonious Monk International Jazz Competition, saxophonist Jon Iragabon. When I suggested this song to him, he also fell in love with it and recorded it on his album for Concord Jazz, also the owner of the original Prestige recording. Because the melody interpretation and improvised soloing blend together in the space of only two choruses, we have created a Melody/Solo transcription with everything that both Art and Gigi play on this recording (C concert, B♭ and E♭ editions). This recording of The Infant's Song is two choruses long. Art Farmer plays the melody for the entire first chorus while Gigi Gryce adds a simple line underneath for harmonic interest. Gigi then solos for two A sections in the second chorus CLIPGGsolo, and Art then solos for the bridge AFSOLOCLIP and takes it out from C.
In the second chorus, Art's and Gigi's lines imply a double-time feel. Though the rhythm section never actually doubles up, there are so many faster lines in these solos that we have written the two A sections and bridge of the second chorus at twice the tempo (cut time), with the note values twice as long as they actually are. This makes the solos easier to read and see how the lines relate to bebop lines played at faster tempos. Saxophonist Kira Daglio Fine uses the Minus You track to inspire her interpretation as she plays along with it at the jazzleadsheets.com studio. This is one of two gorgeous Gryce ballads that we picked to record on "The Gigi Gryce Project," the other being Evening In Casablanca, which featured Bobby Porcelli as soloist. The Infant's Song features Ralph Moore as soloist. Gigi's original recordings of both of these ballads featured melody and soloing interplay between two horns; they're fascinating to study, so we've provided melody/solo transcriptions for the Farmer/Gryce version. Click on that album cover for details. This version, recorded for jazzleadsheets.com's Gigi Gryce Project, is arranged similarly to the original recording, with the same intro and ending. It's longer than the original: two full choruses plus another second half of a chorus. As with the original, the alto plays the intro melody. On the head, the division of melody is the reverse of our version of Evening In Casablanca: tenor on the A and C sections, with alto on the bridge. This is followed by a full chorus of tenor solo. The head out is then taken from the bridge—again alto on B and tenor on C. As with our Evening in Casablanca, the horn that is not playing the melody has "pads" based on those of the original recording, except on the first A of the head. The third to last measure of the coda has alto on the melody until the last three sixteenth notes which the tenor takes over as a pickup to the last two chords. At this session, a Minus You version was also recorded without the horns; click on the Minus You tab for more details. Click on The Gigi Gryce Project to see all the Gryce titles included on the album. This version, recorded for jazzleadsheets.com's "The Gigi Gryce Project," is arranged similarly to the original Gigi Gryce/Art Farmer recording, with the same intro and ending. It's longer than the original: two full choruses plus another second half of a chorus. As with the original, the alto plays the intro melody. On the head, the division of melody is the reverse of the jazzleadsheets.com's version of Evening In Casablanca: tenor on the A and C sections, with alto on the bridge. This is followed by a full chorus of tenor solo. The head out is then taken from the bridge—again alto on B and tenor on C. As with our Evening in Casablanca, the horn that is not playing the melody has "pads" based on those of the original recording, except on the first A of the head. The third to last measure of the coda has alto on the melody until the last three sixteenth notes which the tenor takes over as a pickup to the last two chords. At this session, a Minus You version was also recorded without the horns; click on the Minus You tab for more details. Our Minus You [melody] version of this song [clip] is a different take from the quintet version. This is a Minus Melody track with piano, bass, and drums. You will hear a one-measure count off that sets up the intro. To see how it works, click on the video above showing Kira Daglio Fine playing along with the track at jazzleadsheets.com.